Extend your brand – 3 Card Monte is a magical pocket-sized premium that focuses attention on your message. It’s easy-to-learn and easy-to-do. 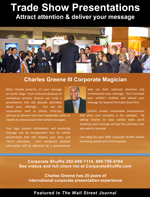 Your sales team can use the 3 Card Montes to teach their customers how to “do a little magic” with your message. See 3 Card Monte in action. Your logo and message take center stage each time this illusion is performed. 3 Card Monte is easy to learn. Each set is packed in a poly bag that includes instructions and illustrations. It the perfect premium for trade shows, sales meetings and customer events. Here’s how the illusion looks: Three playing cards are shown and the spectator is invited to watch the middle card. Let’s say it’s the Four of Hearts. When the middle card is turned over again it has changed from the Four of Hearts into a card with your company message and logo. Digital art is preferred in Adobe Illustrator CS4 format for best results. Also accepted are Photoshop, JPG, EPS, or TIFF. Images must be high resolution (300 dpi or greater). Microsoft Word, Powerpoint, or Pagemaker files are not acceptable. Camera ready b/w artwork is required for all orders. The artwork must fit within a 3” X 2” space. Delivery time is approximately 3 weeks. PMS color matches are available. Only straight colors can be printed. Bleeds and blends can not be printed. 3 colors is the maximum for each card. Order 3 Card Monte with your custom-printed message.